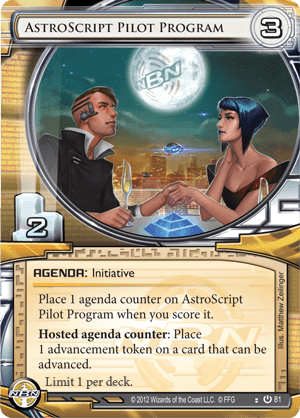 Orion and I had a lot of fun writing out our advice on Netrunner Strategy. So much fun, in fact, that we wrote far more than we had anticipated! This is a good problem to have because it means that Netrunner Week is going to continue until Monday! This article will cover our advice for deckbuilding on both the runner and the corp sides. Then, on Monday we’ll have our strategy tips for actually playing the game. If you want to get better at Netrunner and deckbuilding, the best way is by going on netrunnerdb.com and looking up some popular and successful decks. 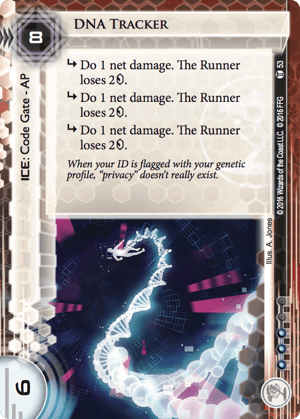 That may seem counter intuitive, but there’s a lot going on in Netrunner and starting with a good deck and focusing on improving your play is easier than diving into deckbuilding. Additionally when you netdeck, try to pay attention to when you use certain cards and figure out why certain cards are good. That being said, I will attempt to layout some deck building principles which will give you a framework for building coherent decks and hopefully help you improve. Let’s do some quick brute force math to form a baseline. 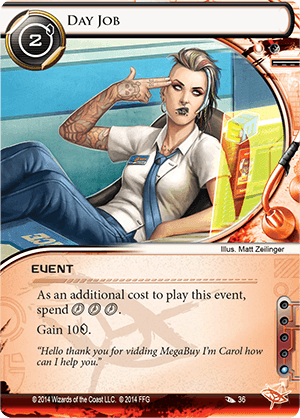 The average corp deck will be running about 9 mostly 2 point agendas so you should plan to find 4 of them. 9 agendas out of the standard 49 card deck means 1 in 5 cards is an agenda. This means that you need a plan to access 20 unique cards from the corp’s central servers. That’s our average case before any optimizations. That means 20 successful runs, which is a lot to ask. To bring that number down we need ways to make our runs more efficient. The primary deckbuilding way of doing that is by accessing more than one card on your runs. Of course you can also gain more efficient accesses by running their remote or HQ when those are likely to contain agendas. We’ll touch on that more in the strategy section. So our first principle of a good deck is multi-access. There are direct and indirect forms of multi-access. An example of direct multi-access is The Maker’s Eye, a 2 cost run event that lets you see two additional cards from R&D. Simple and straightforward. This saves you two runs allowing you to save clicks and credits breaking their ice additional times. Other examples of this would be Legwork, Medium, and Keyhole. They all let you see multiple cards in a single run. An indirect form of multi-access is something like Spycam or Noise. Spycam lets you check R&D before committing to running, allowing you to make surgical runs only when it’s worth running, i.e. when there’s an agenda to steal. Noise’s ability lets you force the corp to trash random cards giving you pseudo accesses later when you check Archives. Once we’ve drawn or installed our multi-access the next thing we need are ice solutions. By “ice solutions” I mean a way to get past the corp’s ice. This can be an icebreaker rig or other combination of tools which let you break, bypass, or otherwise get past ice. The basic case is an ice breaker which can break each type of ice–barrier, sentry, and code gate. Generally I’d say run two copies for each type of ice. This is an area where selections will vary widely depending on your strategy. Explore and theorycraft other setups. E.g. Criminals can include Inside Job and Sneakdoor Beta to fill part of their ice solutions and run fewer breakers. The principle for this section is to have a solution for each type of ice. You don’t always have to break ice to win, but you should have an answer for each type of ice. As suggested above, the next thing we need is credit econ to pay for installing/playing those breakers and multi-access. This could be a whole article in itself, however I’ll try to summarize. There are two categories of credit econ–click econ and clickless econ. Click econ is something like Magnum Opus or Sure Gamble. You spend a click and gain X credits. Sometimes it’s a one shot like Sure Gamble, sometimes it’s a limited number of clicks like Armitage Codebusting, and sometimes there’s no upper bound like MOpus. However all of these are driven by spending a click and immediately getting some number of credits. It’s generally more bursty and don’t have other prerequisites like a successful run. Clickless econ is from cards, usually resources, which you install once and passively gain credits each turn or each time you do something. This can be something like Daily Casts, Underworld Contacts, or Desperado. Choosing the right credit econ varies quite a bit by deck but I’ll recommend as a rule of thumb putting in 10-12 credit econ cards covering a mix of both categories and costs. You can always click for credits if you need, but if you find yourself doing that extensively you should consider adding more economy cards. It’s better to err on the side of too much econ in your deck than too little. Finally we need to draw all these cards we’ve been discussing so you need efficient card draw. This can come in the form of flat-out drawing additional cards or “tutoring”, which means searching your deck for specific cards. Shapers are especially good at tutoring for programs and should always consider running 3 copies of Self-Modifying Code. Criminals should consider Special Order to pull their breakers into hand. Anarchs don’t have great R&D tutoring but are good at retrieving cards from Archives (like with Deja Vu) so including extra draw and discarding some cards into Archives for later can work. Some solid card draw options are Diesel, Quality Time, Earthrise Hotel, and I’ve Had Worse. I’d recommend including 3-6 of those plus some faction appropriate tutoring. In summary, we have 3-6 multi-access, 6-10 ice solutions, 10-12 credit econ, and 4-8 card draw. That brings us to somewhere around 30 cards. It’s nearly always more efficient to build the minimum deck size as that improves consistency in finding the cards you want. Think about it this way: if you have an oversize deck and remove the worst card, you are improving your deck. That leaves about 15 deck slots to play with. This is where you put your fun tricks, tech cards, and silver bullets. Getting killed by Scorched Earth or Boom!? Add a Plascrete Carapace, Sports Hoppers, or I’ve Had Worse. Encountering a lot of Jinteki net damage decks? Toss in a Feedback Filter. Playing Criminal or have a lot of influence to spare? Add Account Siphon. Don’t question me, just do it. Explore your creativity, but don’t forget the essentials. More so than with runners, corps need to have a very specific gameplan when deckbuilding. I’ve identified three very broad categories of corp decks: Rush, Glacier, and Trap/Prison. A rush deck will attempt to score out quickly behind “end the run” ice before the runner has a chance to set up their rig at all. Frequently this kind of deck will have a kill combo as an alternative win condition. Examples from the past include Supermodernism and Russian NEH (which is now very illegal for tournament play, but ignore that for now). A glacier deck has a longer gameplan. It wants to build up a board state full of ice that makes running on any important server very expensive. It will also frequently guard its agendas with defensive upgrades such as Caprice Neisi. The prototypical glacier deck is the 2015 World Championship winning Foodcoats. Finally, we have the trap and prison decks. They’re actually very different, but I’m linking them together because they aren’t run very often and because they both act more passively to try to kill the runner. What I am calling a trap deck will essentially always be in Jinteki PE or PU and rely on whittling the runner down with repeated instances of damage until they are out of cards and are killed, or until they are too scared to run effectively while you score agendas. The original deck in this “thousand cuts” style is called Cambridge PE. The prison deck attempts to build a board state through many assets that the runner cannot keep up with. Then, usually utilizing Hostile Infrastructure and Bio-Ethics Association, it slowly grinds down the runner until they die or are otherwise trapped in an unwinnable situation. The perfect example of this is Hot Tub Time Machine. These are very, very broad categorizations, but they’re helpful to consider for this reason: each of those decks has a primary (and maybe secondary) method of winning the game, and it is directed entirely towards those strategies. I always like to focus on two strategies in case the primary one fails. 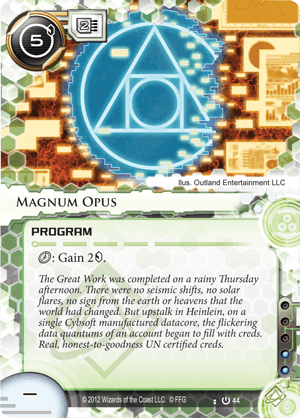 The idea of tempo in a game like Netrunner needs to be understood relatively. On your turn, you should always be advancing your win relative to the runner. Frequently this means putting pressure on the runner to run, spend money, or otherwise be reckless. In order to do this, you need to shape your deck to allow this. Look at the Russian NEH deck I linked to above as an example. It is a lightning fast deck, but it also is highly aggressive in the tempo game. 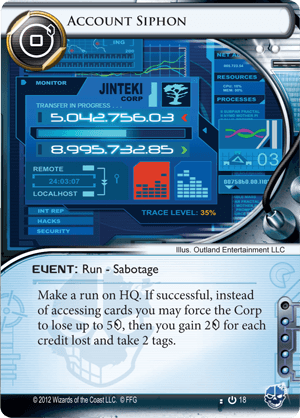 It contains quite a few cards that the runner will want to trash, such as Sensie Actor’s Union, SanSan City Grid, and Jeeves Model Bioroids. Remember that trashing a card costs the runner both money and clicks, so even if they do trash the asset immediately, you have gained in the exchange. Furthermore, Russian NEH has only one piece of ice that does not have an “end the run” subroutine. This means that it can, with the help of the NEH ability, rush out expensive assets early and start scoring agendas behind very cheap end the run ice before the runner has time and/or money to get breakers out that can get through that ice. This is creating tempo on two fronts, which is why it was a very effective deck. But a deck does not need to be fast to win the tempo game. Foodcoats was such an effective deck because it created tempo through very efficient economy (Breaker Bay Grid + Adonis or Eve Campaigns) and very efficient ice. It was able, with the help of the ETF ability and Caprice, to make continuous marginal tempo gains over the runner and gain a large number of scoring windows. The advice here on out will come with the caveat “unless this doesn’t work with your very focused strategy”. I’m going to be assuming that you’re trying to construct a basic deck that tries to score agendas, regardless if it’s more focused on rush or glacier. Like with runner deckbuilding, you absolutely need to have enough money to accomplish your goals, and you should err on the side of more money. 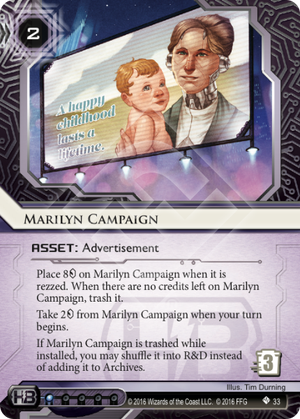 There are a lot of fantastic economy cards for the corp–Hedge Fund, Restructure, IPO, and Celebrity Gift are great for burst econ, and Marilyn Campaign, NASX, Pad Campaign, and Mumba Temple work well for passive econ. I find that 9-15 econ cards are generally a good number to include depending on how expensive your ice is. But economy should also be diversified in order to protect against being locked out from your money sources. Passive econ is more efficient per click, but it can be snuffed out by the runner with the aid of Whizzard, Scrubber, or Temujin Contract. 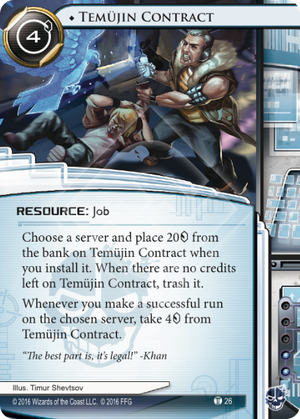 Because of the popularity of Whizzard and Temujin specifically, I’ve been leaning more towards burst econ sources, even if it means I need to include more econ cards total. Efficiency with ice comes down to two fundamental questions. First, does this ice cost a lot to break with common breakers relative to its rez cost? The closer you can get to (or exceed) a 1:1 ratio between cost to break and cost to rez, the better. Second, how bad is it if the subroutines fire? Ideally I want to have ice in my deck that either ends the run or hurts a lot to run through. Two pieces of ice that meet both requirements are Eli 1.0 and Architect (so much so that they’ve been placed on the Most Wanted List, which makes them more expensive to include in competitive decks). Eli, at 3 credits, has a fantastic cost ratio. Originally the most common and efficient barrier breaker was Corroder, which spends 4 credits to get through Eli. Now Corroder has been surpassed by Paperclip, but even then it maintains a 1:1 ratio. The downside, of course, is that the runner can spend 2 clicks to bypass Eli entirely, but that is still a fairly significant tempo hit for them. Architect costs 4 to rez and is broken with 2 credits by Mimic, which certainly isn’t amazing. (It costs 3 credits with Mongoose or MKUltra, which is much better). However, Architect is nearly always going to be a must-break piece of ice because the subroutines are so significant. They give a massive tempo gain to the corp by allowing them to install cards without spending clicks and save money in the process. You also need to be purposeful with your ice. Generally speaking, most of your ice needs to work well in multiple contexts. You never know when you’re going to draw a given piece of ice so the more cards that can patch holes in your servers, the better. Even then, there should be an ideal and purposeful place of each piece. A piece of ice like Vanilla can help you score out early before the runner can find a barrier breaker, but it can also tax the runner at a good cost ratio in a central server. Architect is best on RnD because you can peek at the top 5 cards and install one (potentially removing an agenda before it can be stolen) if the runner can’t break it, but it also isn’t bad placed elsewhere. When creating your deck, strike a balance between ice that works best covering a central server and ice that will work well in a scoring remote or protecting important assets. Additionally, you should include an appropriate number of ice. Usually 15-18 pieces is good, but you can go down to 11 or 12 (or even lower) with a rush deck. You should also almost always avoid conditional ice like TL;DR because they detract from the consistency of your deck. You want ice to always be helpful to you when it enters your hand, and conditional ice is very difficult to place effectively. The best conditional ice strategy I’ve seen is the Data Raven and Data Ward combo. That only works well because Data Raven is a good piece of ice outside of its place in the combo and because, if executed, it has absolutely absurd cost ratios. 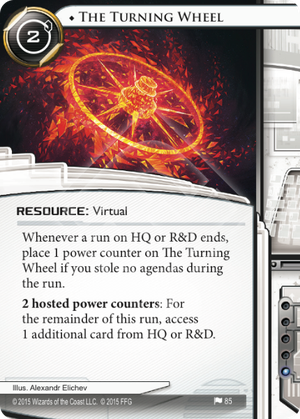 There’s no trick here–in Netrunner some agendas are just better than others. Specifically, you’re going to want to prioritize any 3/2 agenda like Accelerated Beta Test for the simple fact that it has the best ratio of any 2-point agenda, and it can be “never advanced”. That means you can place it facedown in a server on one turn, where it looks like any number of things to the runner, and then scored the following turn. This is undeniably powerful and it will win you games you would have otherwise lost. The best agenda in the game. Period. Global Food Initiative is the king of 3-point agendas because of the way it gives you tempo simply by being in your deck. If, like in Foodcoats, you run GFI and entirely 2-point agendas, that means that in order to win the game, the runner needs to steal 4 agendas, while you only need to score 3 agendas. Agendas that defend themselves, like NAPD Contract and The Future Perfect are also good, as are 2/1 agendas that can be scored from hand. In short, any 3/1 or 4/2 agenda needs to have a powerful effect to warrant inclusion in your deck, because they are inherently less efficient than other options. That means that they’re not only harder to score out, but they increase the agenda density of your deck. If you have 9 agendas in your deck, each run is inherently less profitable than if you have 14 agendas. We could go on and on with deckbuilding advice, but I hope this gives you a good idea of how to approach the process. Join us Monday for more strategy tips! Factual Clarification: Eli 1.0 was on the most wanted list but has since been removed.